Certain industries appear more immune to customer defection than others, as an example, think of your bank or airline you choose to fly. In these industries, customers perceive there is a limited choice between suppliers, and that other supplier alternatives are just as flawed. Customers may believe that their provider’s problems are endemic to the industry, and are truly not fixable. So why bother going through all the hassle to switch a provider if the alternative isn’t any better? An obvious example is the cellular provider market. Most customers believe there are only a handful of viable alternatives. And most would say that those suppliers shared common issues (cryptic billing, excessive data charges, etc.) And virtually all customers would say that cellular providers are unable — or unwilling — to find fixes for these issues. In these cases, the level of friction between a customer and their supplier can reach very high levels before the customer is ready to jump ship. In research done by The Verde Group, 90% of wireless customers reported having at least one problem with their provider in the past 6 months. More likely, these ‘captive customers’ will carry on in the relationship, unhappy but unwilling to make a change. Marketers in these industries shouldn’t be complacent, however. Captive customers pose at least two risks — including one that could strike a non-recoverable blow to the business. The first risk involves cross-selling and up-selling to these customers. True, they buy from you today, but they don’t really want to. As a result, your ability to sell new products and services to them is minimal and requires a tremendous amount of marketing dollars to get a little bit of lift in sales. This is not good news for providers looking to grow their business by way of their installed base. That pales in comparison to the second risk — disruption. Those unhappy customers will be quick to embrace non-traditional alternatives when they emerge. And that can have devastating effects. Just ask Yellow Cab, once San Francisco’s largest taxi company, who filed for bankruptcy protection in 2016 — largely thanks to Uber. And what about Airbnb’s impact on the hotel industry? Morgan Stanley forecasted that in 2018, due to Airbnb, U.S. and European hotels’ revenue per available room would decrease by 2.6 percent. So when do customers actually leave a supplier? Again, it varies by industry, but The Verde Group research shows that across industries, problem frequency is a strong predictor — the incidence of a specific number of problems, regardless of what they are, tends to be the tipping point. In retail, for example, our research indicates that after just two issues, things are at their worst point with customers. That’s when they’re most susceptible to defection. Another type of issue that leads to customer loss is a ‘category killer’ problem — one that happens infrequently but does maximum damage to the customer relationship. These problems tend to be related to your core value proposition. For example, a delivery company who cannot reliably deliver, or an insurance company who doesn’t pay claims properly. These types of issues have one thing in common —they tend to sever customer loyalty completely, and recovery is almost impossible. Although ‘never’ is not really a relative term, different industries use different timeframes to measure customer loss. In retail, for example, a customer who stops shopping for three or four months is the equivalent of a 100 percent loss. They may return after six months, but at that point, they’ll be considered a ‘new’ customer. If you’re in the agricultural industry, the measurement is different. It’s an annual cycle, so if a farmer doesn’t purchase from a supplier for a year, they’re deemed to have left. If they return in three years, they’re classified as a new customer. They may come back — but when? 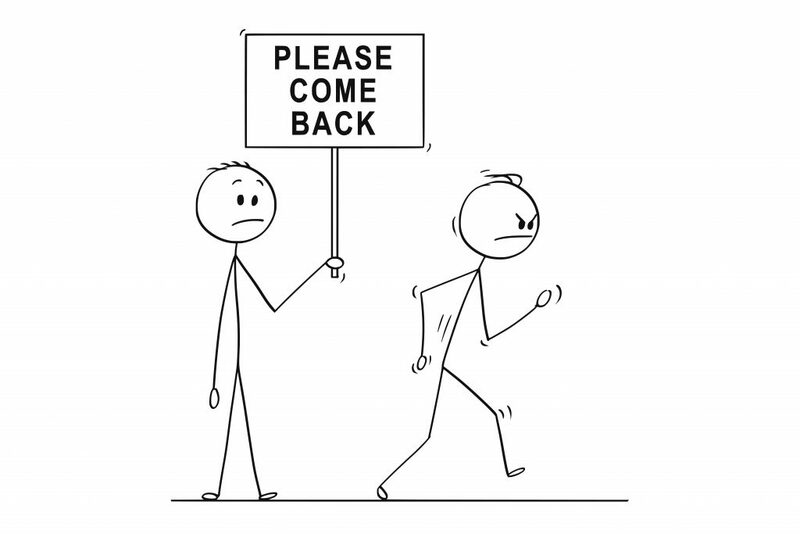 While some customers never (and I mean never) come back, many do. And often it’s the type of problem they encountered that determines the length of time before they return. This is known as ‘the ‘decay’ period. Core business problems or egregious issues typically have a much higher decay window. In other words, don’t hold your breath. Those customers aren’t coming back anytime soon — if ever. Peripheral issues (such as customer support, stock problems, or delivery challenges) can have shorter decay periods. Customers may in effect put their suppliers in the penalty box, but some eventually come back, and do so in a shorter period. It’s critical for companies to develop a complete view of customer problems. They need to monitor frequency, resolution, and customer perception. They also need to be vigilant in guarding against catastrophic, category-killer issues. Finally, even if doesn’t appear that customers are ripe for defection, companies can’t afford to be complacent. After all, the next Uber could be right around the corner. NPS is Just Part of a Much Larger ToolkitIs Amazon Making You a Lazy Shopper?